Years before I ever meditated regularly (and long before I became a proponent of stuffing crystals in my bra), I was just a normal girl living a normal life. Like a lot of people I was in a job I didn't love, and I spent most of my days with my feet shoved in uncomfy shoes, my body jammed in stiff suits and my heart kept neatly in a little box so as not to offend the status quo of the work world. I felt confused and at odds with life, and I had this persistent feeling that there had to be something more. But I didn’t know how to find it. One day on a lunch break I stumbled upon a little metaphysical shop near my office. I remember feeling curious, like there was magic inside, some sort of instant fix for my life, and yet at the same time I felt nervous to go in. I wanted so desperately to be the girl who totally fit in walking into a shop like this, but at the same time it felt so completely foreign to who I was then. After a lot of internal debate, I willed myself in and stood in front of baskets and baskets of crystals with tears streaming down my face. Gingerly I picked up a few that called to me and spent my entire lunch break painstakingly writing their meanings down on little scraps of paper the store provided. When I got home that evening I remember feeling kind of silly. The magic of the shop had passed, and I wasn't really sure what I was supposed to "do" with all these rocks. The desire was there and the truth alarm was sounding like crazy in my heart, but I didn’t know how to practically incorporate mysticism into my life to feel better. Fast forward over a decade. The suits have been exchanged for stretchy pants and the striving replaced by knowing. I feel more confident and at peace than I ever have, and I’m living a life I absolutely adore. I have become the girl who feels right at home in those metaphysical shops, and signs of the mystical adorn my home and my heart. The secret for me has been following my excitement and curiosity. I learned how to meditate one day at a time, and that handful of crystals led to a deck of oracle cards. Which led to magic oils. Which led to books and workshops and retreats and mentors. Which led to whatever excited me next. It was a slow, sweet process with times of huge expansion mixed with a lot of tough lessons. And somehow I always knew those crystals were the first brave step and an important part of the journey that got me here today. But none of it would have happened if I hadn’t been willing to step outside of who I was and step toward who I wanted to be. Who is your heart calling you to be? When you look at your life do you see room for more fun, more magic, more connection to this incredible universe we live in? These days I don't waste time judging myself for my nudges. I simply follow them. They have led me to experiences that once would have been wildly out of my comfort zone but have made me a person I am so proud of today. I am so grateful for the girl who bought those crystals those many moons ago. Without her curiosity and vulnerability, I might not be the empowered, spiritually-connected person I am today. Her bravery paved the way for my unabashed authenticity. And now I am inviting you to step toward your own excitement, curiosity and truth. 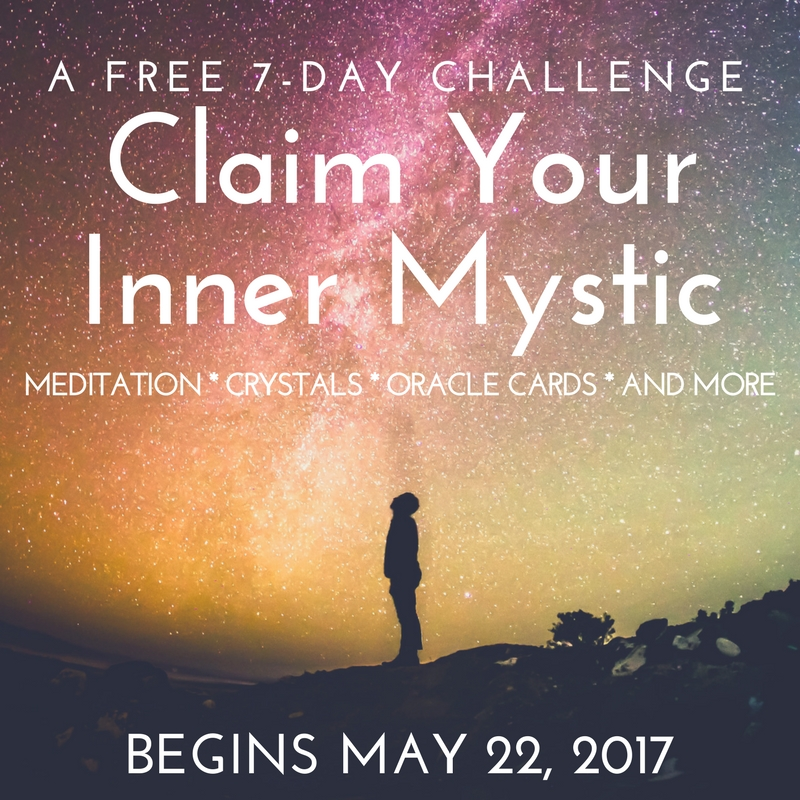 Join me for a 7-day challenge to Claim Your Inner Mystic! I’m taking the high-level themes of my spiritual lessons over the past decade and converting those into 7 days of easy prompts and fun activities to get you on your way to unlocking the connected, spiritual mystic right there inside of you. You’ll join others just like you as we look at our beliefs, learn about the fundamentals of meditation, and gain basic knowledge on how to use mystical tools like crystals and oracle cards for energetic support and guidance. Oh and it’s completely free to join! Just sign up here and we’ll begin on May 22nd. Allow yourself to be pulled. Decide to believe in magic. Step toward the life you desire.